Olivenhain is a upscale, prestigious rural community in southeast Encinitas, adjacent to Rancho Santa Fe and just minutes from North San Diego County beaches. With the country-like atmosphere and convenience of nearby shops and services, people here feel like they've discovered the best of both worlds. The Olivenhain Zip Code is 92024. Search MLS data for Olivenhain real estate & Olivenhain homes for sale. 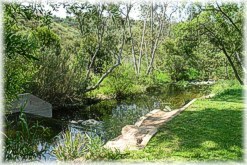 The area was originally founded by a colony of German families who settled on a tract of land called Rancho Las Encinitas ("little oak trees"') in 1884. The name Olivenhain means "olive grove." The old Olivenhain town hall is still used for community meetings and social events. With the decline of farming and the importation of water in the 1950's, Olivenhain was transformed into a residential community. The agricultural areas with rolling hillsides and white picket fences gave way to exclusive custom Olivenhain homes on half-acre plus lots. Many of the residential parcels of land in Olivenhain have fruit orchards filled with a variety of citrus and avocado trees. In keeping with the rural lifestyle, you'll rarely find sidewalks or street lights here. Residents treasure the rural character of their community and are determined to protect it from encroaching development. Horses and gardening are big hobbies for the people who call Olivenhain their home. A series of horse trails wind throughout Olivenhain, providing horse owners with a quiet and peaceful place to ride. 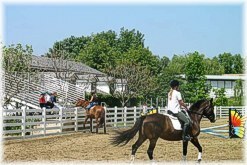 Equestrian facilities and horse arenas attract hundreds each year to ride and show their horses. You'll really enjoy spending some time at the West Village Shopping Center in Olivenhain. It's low-key but high-style, reflecting the discriminating clientele from Olivenhain and Rancho Santa Fe. Search MLS data for Olivenhain real estate & Olivenhain homes for sale. The Harvest Ranch Market features gourmet food with superb produce, meats and a fabulous deli section. There are also a couple of popular restaurants, art shops, a boutique home furnishing store plus the basic retail services. For a special treat, take a coffee/desert break at the Champagne French Bakery Cafe - very nice. Olivenhain real estate is valuable and highly sought after. The spacious Olivenhain homes on large lots appeal to families looking for a little more elbow room in a wholesome country-like atmosphere. Having a home in Olivenhain is a dream and many of the residents moved up from more modest homes in the adjacent communities. Finding a good vacant lot in Olivenhain, suitable for building, is getting harder to find. A few custom home sites still remain in Wildflower Estates, an exclusive gated community considered to be the jewel of Olivenhain. Wildflower Estates lots range from 1.5 to 5.5 acres in size with lot prices up to $2 million. The beautiful rural area of Olivenhain offers mostly single-family homes. You'll only find 105 Olivenhain condominiums that are quickly snapped up when they occasionally come on the market. Search MLS data for Olivenhain real estate & Olivenhain homes for sale. Olivenhain schools are outstanding and among the best in San Diego County. Children attend the Encinitas Union Elementary School District and the prestigious San Dieguito Union High School District for high school. Many parents are drawn to the area just so their children can attend Olivenhain Pioneer Elementary School. Excellent private schools are also conveniently located in the Olivenhain area. See more information below on Olivenhain schools or go to School Reports. If you want to buy a home in Olivenhain or if you already own a home in Olivenhain, protect your investment by looking at Real Estate Statistics. There, you can track the average sales price, days on the market, sale to list price ratios and more. Included are vital statistics, charts and graphs on Olivenhain real estate, shown on a monthly and annual basis. And, be sure to sign up for the free e-mail reports on Olivenhain real estate trends by going to Real Estate Trends. Want more information on Olivenhain real estate and homes for sale? Click here to contact Neal Hribar, your Berkshire Hathaway HomeServices, California Properties Olivenhain real estate agent. What homes are currently for sale in Olivenhain? Click here to do an instant search of Olivenhain real estate for sale.